BPM 2014 presentation – Check in particular the introduction and slides 14-16. KR 2014 presentation – Check in particular slide 2 and slides 12-23. Writing for Computer Science (3rd Edition). Justin Zobel. Springer. 2015. ISBN: 978-1-4471-6638-2 (Print), 978-1-4471-6639-9 (Online). Electronic edition available via the unibz library through SpringerLink. David Evans, Paul Gruba, Justin Zobel. How to Write a Better Thesis. 2014. Electronic edition available via the unibz library through SpringerLink. Razvan Andonie, Ioan Dzitac. How to Write a Good Paper in Computer Science and How Will It Be Measured by ISI Web of Knowledge. 2010. Jan Mendling, Hajo A. Reijers. How to Write a BPM Conference Paper? 2015. Donald E. Knuth, Tracy Larrabee, Paul M. Roberts. Mathematical Writing. 1987. P. R. Halmos. How to Write Mathematics. 1970. S. Keshav. How to Read a Paper. 2007. Edsger W. Dijkstra. Three Golden Rules for Research. 1982. Dianne Prost O’Leary. Graduate Study in the Computer and Mathematical Sciences: A Survival Manual. 2009. Mikael Berndtsson, Jorgen Hansson, Bjorn Olsson, Bjorn Lundell. 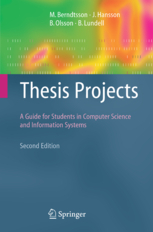 Thesis Projects: A Guide for Students in Computer Science and Information Systems. 2008. Committee on Academic Careers for Experimental Computer Scientists, National Research Council. Careers for Experimental Computer Scientists. 1994. Peter Wegner. Research Paradigms in Computer Science. 1976. David A. Patterson. How to Have a Bad Career in Research/Academia. 1976. MJMD Branding untuk angkatan 2015 Program Doktoral Ilmu Komputer DIKE MIPA UGM.